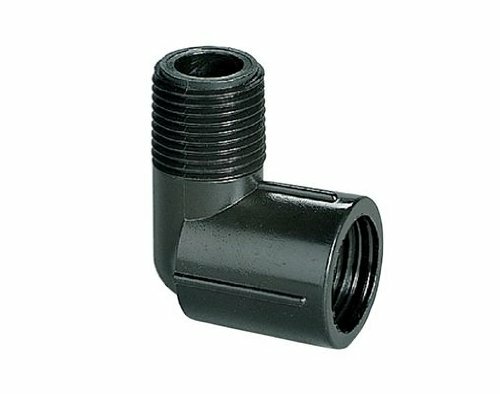 This Orbit swing-joint elbow pipe fitting is built for installing garden sprinkler heads. This irrigation pipe fitting has a '-inch MNPT (Male National Pipe Thread) connection and a '-inch FNPT (Female National Pipe Thread) connection so it easily connects to a barb pipe fitting or funny pipe to get better vertical spray coverage from your lawn sprinkler heads. This Orbit sprinkler part easily connects to PVC irrigation pipe and flex pipe to create swing-joint connections that are versatile and simple to use. This is an ideal sprinkler system part for sprinkler head installation and sprinkler systems repairs. Features and Benefits: Has a '-inch male-threaded inlet and a '-inch female-threaded inlet, Use with flex pipe or funny pipe as well as PVC sprinkler pipes, Attaches yard sprinkler heads to in ground irrigation pipes, Durable construction ensures many years of dependable use.